A Leonid meteor storm was anticipated in 1932 or 1933, the centennial anniversary of one in 1833 which filled the sky over the Americas with meteors and fireballs. That sight was so astonishing and terrifying that the unprepared populace thought the end of the world had arrived. Only coincidental with the centennial, 1932 and 1933 were tragic years when many a person’s economic world ended. Koch, R.H., Observational Astronomy at the University of Pennsylvania, 1751-1996; privately published, 2008, pp. 60-75. 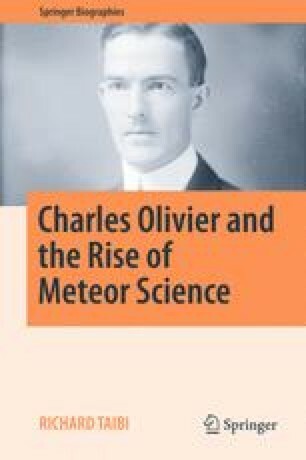 The book was available online at: http://gravic.com/graviclabs/pdf/astronomy/Observational%20Astronomy%20at%20UP%201751%20-%20Revision%20B.pdf Accessed April 24, 2016, however this URL (web address) changes frequently and the reader may need to use a search engine to locate Dr. Koch’s book. Koch, R.H., Observational Astronomy at the University of Pennsylvania, 1751-1996; privately published, 2008, pp. 60-75. The book is available online at: http://gravic.com/graviclabs/pdf/astronomy/Observational%20Astronomy%20at%20UP%201751%20-%20Revision%20B.pdf Accessed April 24, 2016, however this URL (web address) changes frequently and the reader may need to use a search engine to locate Dr. Koch’s book. Olivier, C., Flower Observatory Reprints, Numbers 5 (1929), 8 (1930), 12 (1931), 15 (1932) and 22 (1933); University of Pennsylvania’s Archives, 3401 Market St., Philadelphia, PA 19104. Request a finding aid for the reprints at http://www.archives.upenn.edu/home/archives.html. Accessed on April 27, 2016. Olivier, C., Methods for Computing the Heights and Paths of Fireballs, Flower Observatory Reprint No.11; University of Pennsylvania’s Archives, 3401 Market St., Philadelphia, PA 19104. Request a finding aid for the reprints at http://www.archives.upenn.edu/home/archives.html. Accessed on April 27, 2016.